I much prefer the look of Quirky's Trek Support backpack to Voltaic's solar-powered backpack from years ago, and if enough people agree with me and pre-order it (for $130), they'll even put it into production. Just like the rest of Quirky's products, the backpack design has been crowdsourced, but it just needs enough people to pre-order it before putting it on the factory line. 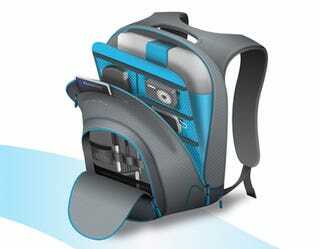 It's about half the price of a solar-powered backpack, and doesn't have the obvious panels on the front—choosing, instead, a subtle grey and blue color-scheme.